Intel Nehalem to be called Core i7? "Tuesday's post on Mac average selling prices set off a firestorm of controversy. It's time to put out some of those fires. "I've got to chuckle, being on vacation this week. There's nothing relaxing about the religious Mac versus Windows war raging in Apple Watch comments. The comments are fun reading, and I want to thank each commenter. This post is in response to some of you who opined about the topic. "But first, I've got a response to everyone: Nitpicking aside about value and spec versus spec and price versus price comparisons, Mac average selling prices are much higher than Windows PCs. Twice as much for notebooks, or about $750, and $1,000 more for desktops. NPD's data is reliable. That said, my previous post made no value judgment that higher ASPs were somehow bad. Apple has chosen to mainly compete in the 'premium,' or above $1,000, PC market. "'Mac's real value comes from Apple software. Two artists might use the same canvas. One paints a masterpiece and the other a dud. Apple's software is the masterpiece.'" "I'm always looking for a bargain. I'm in charge of buying technology for a small, rural school district; I don't spend much time deciding between SLI video options for my students. "Why did I pay more? Because OS X is a great choice . . . Did I mention that these iMacs have built-in wireless and only run a moderate premium over comparable PCs once you add in a 17" LCD? . . . On the laptop front, the load of MacBooks we snagged are rugged enough that I'm confident they'll survive third-graders...."
"There are a few truths that we all find self evident: all men are created equal, only even numbered Star Trek movies are any good, and home built PCs are always cheaper than anything Apple has to offer. "Gird your loins, fellows, because what I am about to tell you will shock you. Make sure that no children can see the screen, because this news is not for the faint of heart: Tom's Hardware has found that assembling your very own home-brew version of the baseline Mac Pro configuration, using comparable parts, will save you about twenty bucks. When you add a license for OS X, the cost of iLife, and the time and frustration you'll spend getting all that software and hardware working together, you actually would be better off just buying a Mac Pro...."
"How's this for the ultimate digital-age, small-business irony: Want the best possible environment for Microsoft Office? Try running it on a Mac. "Then there is the true small-business marvel: Automater...."
"'From an overall market perspective, there are a ton of Windows (PC) vendors that are quaking in their boots over if Apple decides to lower its prices,' IDC analyst Richard Shim said...."
"(Source: Apple Enterprise Solutions) Why choose Apple for your enterprise solution? From the world's only laptop that starts up in Mac OS X, Microsoft Windows, and Linux to powerful, flexible desktop and server products, Apple is becoming a standard in the enterprise IT infrastructure. Learn how you can begin integrating Apple into your enterprise. "Download this white paper, free, compliments of Apple!" "You know the ones I'm talking about. The candy-colored ones that live forever, even as you're hoping they'll die so you can replace them with something that will run OS X? A few can be upgraded, but OS X is really made for something a bit, well, snappier. Instead of wishing for them to die, though, why not just install Ubuntu on them? "Ubuntu 8.04.1 is the latest and greatest from Canonical and isn't officially supported on older PowerPC hardware (Canonical has moved to AMD and Intel architectures exclusively). However, a community-supported version is available...."
"Many of you had trouble accessing Gmail for a couple of hours this afternoon, and we're really sorry. The issue was caused by a temporary outage in our contacts system that was preventing Gmail from loading properly. Everything should be back to normal by the time you read this. "We heard loud and clear today how much people care about their Gmail accounts. We followed all the emails to our support team and user group, we fielded phone calls from Google Apps customers and friends, and we saw the many Twitter posts. (We also heard from plenty of Googlers, who use Gmail for company email.) We never take for granted the commitment we've made to running an email service that you can count on." "Notebook-ready versions are still due in early 2009." Link: Intel Nehalem to be called Core i7? "We've already shown our affection for Apple's highest-end iMac, but with back-to-school shopping season in full-swing, the time felt right to fill in a gap in our review database by covering the lowest-end, $1,200, 20-inch model. What we find is that the most affordable iMac has the usual content-creation strengths we've come to expect from Apple. And, while some of its features stand out from the competition, we're disappointed by others. Overall, we recommend the 20-inch, 2.4 GHz iMac if you have a budget between $1,000 and $1,500 for a desktop that you'll use for digital media editing." PR: Sonnet Technologies announces the the Presto Gigabit PCIe Server PCI Express network adapter card and the Presto Gigabit PCI-X Server network adapter card. These Sonnet cards add two Gigabit Ethernet ports to any compatible computer, offer enhanced performance through support for jumbo packet data transfers and link aggregation, and deliver improved reliability with transparent failover protection in case a cable gets disconnected or a port fails. Presto Gigabit PCIe Server features a native PCI Express x4 host bus interface for maximum performance in most recent computers, while Presto Gigabit PCI-X Server features a 64-bit, 133 MHz PCI-X host bus interface for maximum performance and even wider compatibility in older computers. 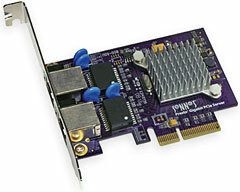 Both Presto Gigabit Server network adapter cards deliver enhanced networking support in compatible computers and gigabit speeds over common CAT-5 cabling, so costly cable replacement is unnecessary to support the higher performance. Presto Gigabit Server network adapter cards' 1000/100/10Base-T auto-negotiation and full/half duplex communication support allow them to be used in most networks. Presto Gigabit PCIe Server is available now for the retail price of $199.95. Presto Gigabit PCI-X Server will be available this month for the retail price of $199.95. Usually you can't burn to a DVD more than once or to a CD more than once without creating a volume (CD icon) for each session burned. With BurnAgain FS you can do both. You can even remove individual files from your disk or open and change documents several times. The format used is platform independent and usable without additional software on all common operating systems. BurnAgain FS integrates into your Mac OS X Desktop and remounts the CD or DVD like a hard disk volume directly in the Finder. Files can be added, removed, even edited and changed several times. At any time the changes can be burned to the media. The title of the disk can be changed prior to each burn. BurnAgain FS does not erase the disk during the burn, it just adds new or changed content and makes removed items inaccessible. That way any disk can be reused efficiently until it is full and adding new items to a disk is also much faster than erasing and burning a new disk. BurnAgain FS supports CD-R, CD-RW, DVD+RW and DVD-RW disks. BurnAgain FS automatically preserves your special Mac file attributes (resource forks) as well. Disks burned with BurnAgain FS are readable without additional software on all platforms. That way disks burned with BurnAgain FS can be used and reused several times for sharing documents with others. BurnAgain FS is especially fast when adding just a few new documents to the disk. That makes burnable media usable again for backup purposes or work in progress. Almost like a hard disk. BurnAgain FS uses the ISO-9660 Rock Ridge standard. If you do not use BurnAgain FS from the start, only disks using that standard that are not closed can be appended by BurnAgain FS. Each session added requires a session overhead in addition to the content added. BurnAgain FS can be tried 20 trial burns for free. BurnAgain FS licenses are available starting at 15€. More details can be found on the store page. All customers who have purchased BurnAgain DVD since 1st January 2008 get BurnAgain FS for free. Just unlock the application with your BurnAgain DVD license information. Customers who have purchased BurnAgain DVD before 2008 can purchase an upgrade to BurnAgain FS. PR: Like Thought announces Opacity Express 1.0, their easy to use editor for screen graphics, exclusively for Mac OS X 10.5 Leopard. Opacity Express is a slimmed down, more affordable version of Opacity. It includes most of the powerful features from Opacity like vectors, layers, variables and factories in an even simpler interface. By leveraging the power of Core Animation and Quartz, Opacity Express combines all of the tools artists need to create beautiful images for icons, applications and the web. Like Opacity, Opacity Express streamlines the image creation workflow by combining a great vector editor and pixel editor with native support for all the formats needed for the screen. Opacity Express is also ready for the future with support for easily preparing graphics for resolution independence. Opacity Express's vector support includes paths, gradients, lines, text, and more. With vectors, users can create images that look great at any resolution. Opacity Express takes this even further with special features like automatic pixel aligning and resolution variables to automatically hide details at low resolutions. With pixels tools including pencil, eraser and fill, it's easy to make images pixel-perfect at every resolution. Opacity Express also supports layers, including folder layers. Every layer has its own opacity and mask. Filters in Opacity Express are live layers that can be added to images (with their own masks) and dynamically changed at any time. 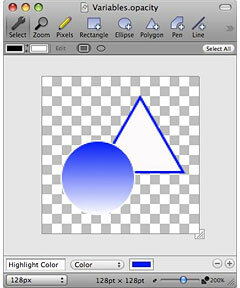 Opacity Express also includes many unique graphic editing features. Previews make it easy to see how an image will look when deployed. Exporting images in Opacity Express only takes one click with Factories. Variables can be assigned to vectors, filters, layers and more to allow creation of powerful dynamic images. Opacity Express includes the features from Opacity that most everyday users will need without the more advanced features needed by professional designers. This makes it more affordable and easier to use for anyone who just needs to make a few images now and then. It's also a great starting point for designing images, users who need more power can easily upgrade an Opacity Express license to an Opacity license at any time. A free trial version of Opacity Express is available for download, and the full version costs $39. Opacity Express requires Mac OS X 10.5 Leopard and is a Universal Binary for PowerPC and Intel Macs.